When people find themselves exhausted, one of the most common things they try to do is find a place to rest. For fatigued people who want to enjoy nature without going too far from the city, The UOS Times visited Coex Aquarium, which shows over 650 species and 40 thousand marine mammals in the heart of the Seoul. Coex Aquarium is located in Yeongdong-daero, Gangnam-gu, Seoul. Since it is located near two subway stations, Bongeunsa Station (Line 9) and Samsung Station (Line 2), it is easy to access. The UOS Times visited Coex Aquarium from the University of Seoul (UOS), which is located near Hoegi Station, so it took about less than two hours to get to a nearby station. However, you have to walk about 10 minutes to get to the entrance of the aquarium after getting off the subway. The whole course consists of 16 parts, including Rainbow Lounge, Amazonia World, Living Reef Gallery, and Penguin’s Playground. As you can guess from the names of each section, you can enjoy different types of marine lives and activities. Men and women of all ages can enjoy the aquarium, and all the sections are meaningful. However, in this article, The UOS Times is going to describe some of the most impressive parts among them. As its name suggests, in this section you can meet creatures that inhabit near the Amazon. The surprising thing here is that you can see not only organisms living in water, but also creatures that inhabit the ground. 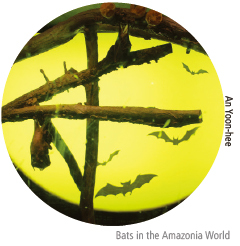 As soon as you set your feet in the Amazonia World, bats will greet you hanging upside down on branches. Since they scarcely move, you may have to stand still and look closely to find them. Moving forwards, people may feel that they are actually walking through the Amazon because of the surroundings that make them think of a jungle, including the sounds of chirping and high humidity. The organisms here (which includes common snake-necked turtles, catfish flower horn, snapping turtles, and crocodiles) are mostly bigger than the ones located in other sections. Also, since there are various types of living things that we usually think of as one species, like the snake-necked turtle, the common snapping turtle, and the alligator snapping turtle, it is also interesting to find the differences between them according to their accurate names. There were also a lot of Piranhas. When people think of Piranhas, a characteristic that they usually first think of is its cruelty. However, when you face Piranhas in Coex Aquarium swimming in a water tank with its friends, you will soon find out there is even more striking feature than cruelty; distance. 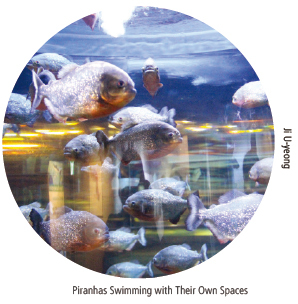 Piranhas need their own spaces, so they swim with having each of its own exact territory. How surprising! 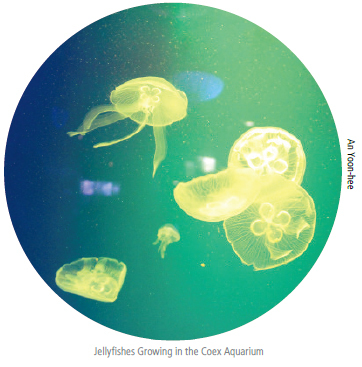 When asked what are the main differences between an aquarium and a sea in nature, people who have visited Coex Aquarium may answer “the process of growth”. Since creatures in this aquarium grow here, visitors can see their process of growth. In this section, the growing process of jellyfish was displayed especially well. From tiny jellyfish that cannot even be easily seen without explanation to the much larger ones, this section presents a surprise to visitors with its delicate classifications. People can also touch some of the marine life, like starfish and sea squirts, and can observe small creatures through a microscope. After enjoying these organisms with all five senses, you can see the rest of the organisms living in water tanks. There are a lot of unusual creatures, but the lionfish attracts special attention with the unique colors on its fin. White, red, and colors existing somewhere between these two embroider its whole body in a striped shape. According to an explanation from the aquarium, the color of its fin can change into various colors, including coal-black. The fin is used when hunting. After driving small fish into a corner, it preys on them with its fin. When you think of an aquarium, what kind of image do you see? Maybe thousands of fish and various kinds of marine lives are freely swimming in a blue background surrounding you. In this section, you can exactly see just such an image. The Deep Blue Sea Tunnel is the tunnel has air in it so you can breathe and walk, enjoying a lot of marine life. Unlike the other sections, here the organisms play right above your head. Also, thanks to a moving walkway on the ground, people can enjoy this section without walking. Since this section is one of the best places to take a photo, it is better to take a lot pictures if you want to really remember the aquarium and its beautiful scenery. There is more to do than simply observing the marine life. Sardine performances and feeding times wait for visitors. 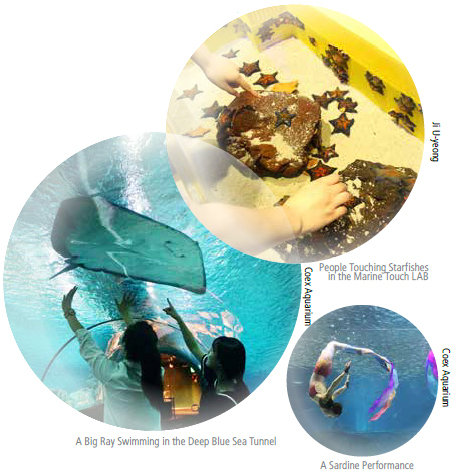 These activities occur according to a schedule that is on the homepage of the aquarium, so please check there if you want to enjoy these programs. If you are considering visiting a place to rest, do not hesitate to choose Coex Aquarium. Interesting explanations about the marine mammals and various creatures that you have never even imagined will greet you.